Today am telling latest news about jobs 2019. 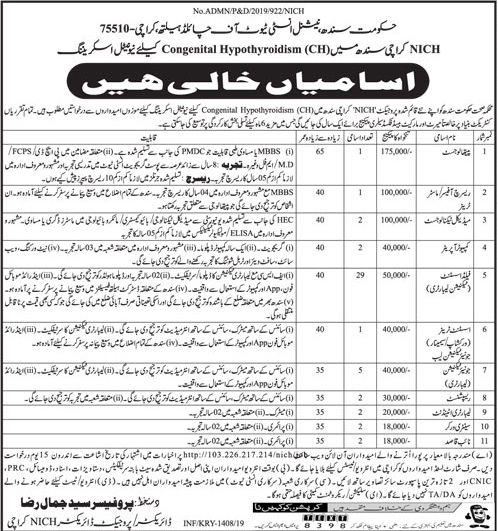 Opportunity is available in National Institute of Child Health NICH Karachi jobs 2019. You can take great advantage from these jobs Applications are being offered from National Institute of Child Health NICH Karachi 2019. Applicants are required to apply for the following posts which include such as Pathologist, Research Office or Master Trainer, Medical Technologist, Computer Operator, Field Assistant (Technician Laboratory), Assistant Trainer (Workshop or Seminar) Jr. Technician Lab, Junior Technician (Laboratory, Receptionist, Laboratory Attendant, Sanitary Worker, Naib Qasid). These positions are for the project named as Neonatal Screening for Congenital Hypothyroidism (CH) in Sindh province at NICH, Karachi. Interested Candidates needs to be filled with the overall qualification of Graduation, Intermediate, Matric, Middle and Ph.D. can apply with relevant skill in the similar capability is required to apply and fill these posts directly. Therefore, Candidates should apply online by visiting the official website of NIIC. If you have a graduation, intermediate, matric & middle degree within any relevant subjects, formerly you are suitable for these jobs. If you are jobless and want to get a good & suitable job, then you should apply to these jobs. The interesting applicant can apply before this Date April 05-2019. All Candidates having a Sindh province domicile can eligible for apply for these jobs. This is a Contractor job. How to Apply for NICH Karachi Jobs 2019? Candidates meeting criteria are recommended to apply online at given website: http://103.226.217.214/nich/job. Only online applications will be kept amused by the selection procedure. Candidates should mention clearly the name of the position applied for on the online application. Candidates should bring all original documents at the time of interview.